Among the social networks, Instagram continues to stand out. With more than 800 million active users a month by the end of 2017, Instagram is expected to reach one billion in 2018, more than double the number of Twitter, WhatsApp and Facebook Messenger. For ecommerce merchants, Instagram is a place to share inspiring images and interact with curious users. Here is a list of tools for ecommerce marketing on Instagram. It includes tools to create and edit content, promote publications, track analytics, and generate sales. Most of these tools are free or have free plans. Instagram business tools. Instagram offers tools for businesses to promote their brands and connect with consumers. Set up your professional profile on Instagram, run and manage ads, and even publish posts directly from the Instagram app. Layout. Use the layout of Instagram to create unique layouts by remixing photos. Choose photos from your filmstrip or use the built-in Photo Booth to take snapshots and instantly see them in different combinations. Choose the layout you prefer, then modify it to become yours. Boomerang. With Instagram's Boomerang, create captivating mini-videos that come and go. The application takes 10 photos and stitches together. Share your videos on Instagram and Facebook directly from the app, or share them later from your filmstrip. Hyperlapse. With Instagram's Hyperlapse, create accelerated videos. When you shoot a video with Hyperlapse, your movie is automatically stabilized to smooth out bumps and give it a cinematic feel. VSCO. VSCO is a photography application and social network. Use his photo editing and diary tools to share your unique point of view. Get inspired by the content prepared by the VSCO team, as well as stories told by other members of the community. VSCO X, an invitation-only subscription service, can enhance your creativity by giving you access to VSCO's comprehensive presets library, enhanced authoring tools, educational content, and newer features. Enlight Photofox. Enlight Photofox is a photo editing app with a variety of advanced features, layers and blend modes with special effects, brushes, fonts, tonal settings, movies and presets in black and white and duet. Overlay images and create double exposures and surreal art. More. Over is an application to add text to images. Add captions, change fonts, play with fun filters, and super-power your creatives with merge and hide tools. Canva. With Canva, design content images with millions of photographs, vectors and illustrations, or download your own. Edit images using predefined filters or use advanced editing tools. Use free icons and shapes and access hundreds of fonts. Repost. Repost for Instagram makes it easy to post your favorite photos and videos on Instagram while giving credit to the original Instagram. AutoHash. AutoHash uses artificial intelligence to find the best hashtags for your Instagram photos. Select a photo and instantly get the best hashtags you need. AutoHash allows you to save your favorite hashtags and add them in one click. Hashtracking. Hashtracking provides detailed statistics on Instagram and Twitter. Track, view and share hashtag data in real time. Archive the reports for later use. Identify key users, content and topics Plans start at $ 50 a month. Later. Later, you can schedule Instagram posts to publish them automatically. Schedule photos, carousels, or video posts. Manage multiple Instagram accounts in one place. Plan your Instagram feed with drag and drop. Messages are sent to your phone at the right time to be posted on Instagram. Premium plans start at $ 9 a month. Stamp. Buffer is a platform for scheduling publications and analyzing performance. Quickly and easily schedule posts for all your social accounts and Buffer will automatically post them from your schedule. Manage all your social media accounts in one place. Premium plans start at $ 99 a month. Social Sprout. 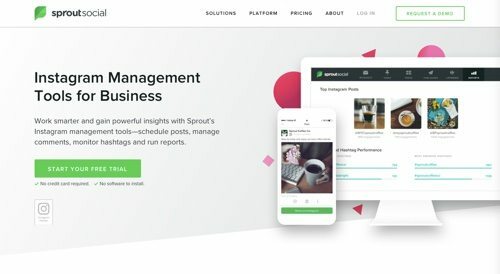 The Sprout integration on Instagram includes tools for planning, publishing and engagement, as well as access to analytics. Schedule and schedule posts, watch for hashtags and placements, and respond to comments. Plans start at $ 99 a month. SocialInsight.io. SocialInsight.io is an Instagram marketing platform. Schedule publications, analyze results, identify and manage followers, and more. Receive weekly and monthly electronic reports. Plans start at $ 29 a month. Minter.io. Minter.io is a tool to track performance on Instagram. Measure the growth of your audience. Find out which of your posts and articles resonate the most with your audience, when your posts get the most "likes" and comments, and which hashtags trigger engagement. Plans start at $ 20 a month. INK361. INK361 is a free tool for actionable Instagram insights. View your profile, interact with your audience, and see how your brand is performing on Instagram. View statistics for your posts, hashtags, likes, and comments. Follow followers and growth over time. Create custom circles to monitor the content of specific accounts. I like2Buy. With a Like2Buy gallery, your fans can read your stories and buy your Instagram feed. Connect your product feed, your content and automatically generate a link in your bio to allow consumers to make their purchases. Contact us for price. Have2Have.It. The Have2Have.It link takes your subscribers to an organized and organized page that looks the same as your brand's Instagram feed. Have2Have.it leads subscribers directly to your website to complete their purchase. Contact us for price. Foursixty. With Foursixty, turn your Instagram content into shoppable galleries for your store, email, blog, and ad campaigns. Show Instagram galleries in your product details pages. Queue and push your latest photos on Instagram, schedule the content, and include links to buy. Plans start at $ 50 a month.